Your source for day-old headlines and unsolicited commentary about the world's greatest entertainer SLASH user-of-on-stage-wind-machines. Today in Beyonce News, you may have heard that she has signed a $50 million deal with Pepsi, which is being touted as "MORE than just an endorsement" because they're going to fund her creative projects or something. Putting aside the fact that Beyonce probably hasn't drunk soda in over a decade, she has to know that Coke and all its subsidiaries are irrefutably, inherently better than Pepsi and its counterparts. She's from Texas, dang it. In this case, I consider that the South, and southerners should know such things. So admittedly I'm a little disappointed in her. But I'm willing to overlook this momentary (50-million-dollar) lapse in judgment in the hopes that something good comes of it. So alas, I will not be able to take part in these delightful Beyonce cans. The article does say that she will be involved creatively, so who knows what could happen next. A short film loosely based on the inner turmoil of Destiny's Child (with not-so-subtle Pepsi logos plastered across buildings in the background)? Coming up this season on... Beyonce News: The HBO documentary. Guys, this is going to be awesome. Stay tuned for updates on #beyoncedocwatch2012. Oh, AND the Superbowl performance. GET EXCITED. She makes it super easy to have an amateur news segment about. 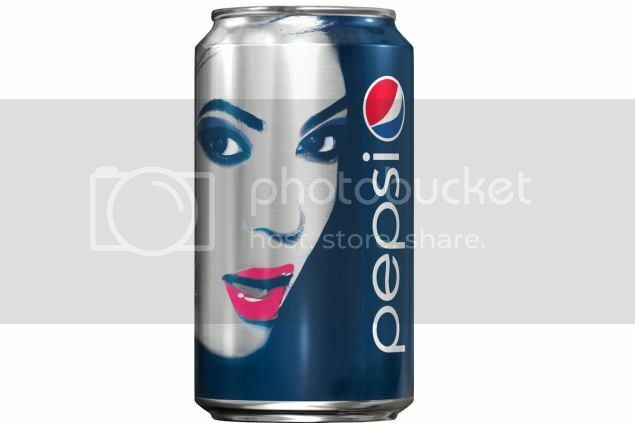 Would you buy a Pepsi can with Beyonce's face on it? Why or why not?